Situated just a few miles east of Atlantic City, Wyoming, are the crumbling ruins of the old mining camp of Miners Delight. The town got its start at about the same time as its sister mining camps of Atlantic City and South Pass City. Gold was first discovered here in Spring Gulch in 1867 and within no time, a mining camp sprang up that was named Hamilton City. However, because the largest and most productive mine, located on Peabody Hill, was called Miners Delight, most people called the town by the same name. The large mine was founded by Jonathan Pugh, and before long, the town’s name was officially changed to Miners Delight. The mine was initially rich enough that a 10-stamp mill was erected to crush the rock. However, like the nearby mining camps, Miners Delight soon found that the gold was more expensive to recover than it was worth and within a few years, its population fell dramatically from its peak of some 75 residents. The Miners Delight Mine first shut down in 1874, but soon reopened, only to shut down again in 1882. 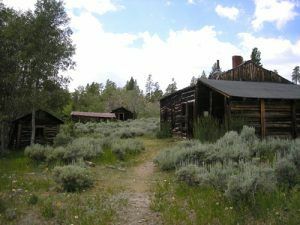 The mining camp recovered several times over the next several decades, in the early 20th century, and during the Great Depression. Over the years the mine produced over $5 million in gold ore. The town was inhabited as late as 1960, but today provides only ruins. 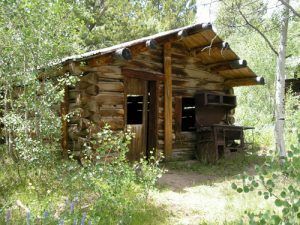 Rusting iron equipment, such as this oId stove, and a couple of iron box screens, can be seen around the cabins of Miners Delight, Wyoming. Miners Delight claims two famous residents — Henry Tompkins Paige Comstock, who would later discover the famous Comstock Lode in Nevada, and Calamity Jane. Born Martha Jane Canary, she was orphaned and adopted at a young age. As a girl, she moved with her new parents to Miners Delight. Later, she was said to have “serviced” the miners in both Atlantic City and Miners Delight, before making her way to other mining camps, including Deadwood, South Dakota. Today, the site is located on Bureau of Land Management property and is not restored. However, some preservation work has been done in order to keep the few remaining buildings standing. The old townsite is listed on the National Register of Historic Places. The townsite is located about three miles east of Atlantic City on Fort Stambaugh Road. Parking is available, but the site must be accessed via a walking trail that is about ¼ mile long. The site continues to preserve several cabins, one building that was said to have been a saloon, a baker, a barn, and a couple of outhouses.